Grand Bahama Island – In an effort to build and partner with their new community over 60 Ross University Medical students along with 4 faculty members and even some spouses, took time away from their studies to volunteer at the Shiloh Seventh Day Adventist Church’s 4th Annual Grand Bahama Health Expo on Sunday, March 29th. The students ran three shifts and manned four booths on diabetes, hypertension, eye and ear health and examination and breast heath and examinations. The booths were supervised by four faculty members: Dr. Veerabhadra Gowda, Dr. Janice Johnson, Dr. Lyudmyla Golub and Dr. Jennifer Cannon. North Brunswick, NJ - According to a new report sponsored by the Josiah Macy, Jr. Foundation, the United States is in dire need of more physicians. But while U.S. medical schools are working to rectify the problem, the report points out that the issue cannot be solved simply by increasing the number of schools or expanding existing schools. "What medical education needs to recognize is that it has a fundamental social mission to train future physicians for a rapidly changing healthcare system that seeks different competencies than in the past," says George Thibault, MD, president of the Josiah Macy, Jr. Foundation. Keynote speaker Mrs. Sharon Williams, Hospital Administrator of the Rand Hospital and guest speakers Dr. Tamara Burke-Moree and Dr. Alvira Higgs. Grand Bahama Island - Although the Ross University academic facilities at Seahorse Plaza have been operational since the beginning of January 2009, an official opening ceremony and ribbon cutting took place on Friday, February 20th. Prime Minister to The Bahamas, the Rt. Hon. Hubert A. Ingraham and his wife, Delores Ingraham attended the momentous occasion, along with many government officials and local dignitaries. Grand Bahama Island, The Bahamas - Prime Minister the Rt. Hon. Hubert Ingraham brought remarks at the official opening and ribbon cutting ceremony for the Ross University Freeport Campus; Sea Horse Plaza held on Friday, February 20, 2009. Mrs. Delores Ingraham cut the ceremonial ribbon at the official opening and ribbon cutting ceremony. The Prime Minister, along with Mrs. Ingraham and Government Ministers viewed the work of Ross University students in the University's Simulation Room, during a tour of the academic facility. Grand Bahama Island – The future looks bright for Grand Bahama as well as for the Ross University medical students who attended their first day of school on Monday, January 12th at the interim campus at Seahorse Plaza in Freeport. The focus for day one was orientation and the beginning of classes, as all the students gathered in their conference area equipped with overhead screens, as the faculty and administrative team were introduced as well as policies and procedures explained. Grand Bahama Island – Ross University invited all doctors in Grand Bahama to a breakfast meeting on Tuesday, December 16th to introduce the Ross faculty to the Island’s medical community. Senator, Kay Forbes-Smith was also in attendance. The meeting provided the opportunity to introduce the Ross’ Clinical Education Partnership which will not only bring a rich educational experience to Ross students, but will enhance the professional growth of Bahamian physicians, thus improving the overall health and medical care system within The Bahamas. Portsmouth, Dominica - As part of its community outreach program, a dozen students of Ross University School of Medicine's Adventist Fellowship, recently visited the Stock Farm State Prison and the Northern District Home for the Aged, in Portsmouth, to donate their medical skills and time. For the past three years, the group which is dedicated to caring for the underserved have visited the prison every semester to educate the inmates on health care issues, provide medical screenings, and donate books to the prison library. Grand Bahama Island - Ross University is pleased to announce and welcome Dr. Desirée Cox, of New Providence as their new Director of Community Clinical Education for the Bahamas campus set to open in January 2009. Grand Bahama Island - Ross University held a five day leadership planning retreat at its new campus from November 19th -23rd. This retreat involved senior Ross University administrators from its New Jersey headquarters, Medical School leadership, and leaders from its Dominica and Miami campuses. 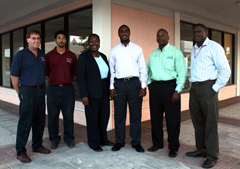 Also participating were current or future staff and faculty for the Bahamas campus. Grand Bahama Island - Ross University is pleased to announce and welcome Mrs. Meg Osman who will fill the position of Director of Student Services at the Bahamas Ross University School of Medicine opening in January 2009. "We are very pleased to have Meg on board and welcome her to the Ross family. I am confident that with Meg’s background and experience in higher education and focus on providing excellent customer service that she will be a great addition to our team," said Rose Reardon, Ross University's Sr. Director of Student Services. Grand Bahama Island – Ross University is pleased to announce and welcome Mr. Subir Das Gupta who will fill the position of Director of Finance and Administration at the Bahamas Ross University School of Medicine opening in January 2009. Prior to this appointment, Mr. Das Gupta headed the Finance Department of the Penthouse Group, a privately-held group engaged in the hotel and property sectors. Ross University is proud to celebrate its 30th anniversary as one of the world’s preeminent providers of medical education. Grand Bahama Island - Ross University is pleased to announce and welcome Mr. Londell Albury who will fill the position of Director of Information Technology (IT) at the Bahamas Ross University School of Medicine opening in January 2009. “We are very excited to have Londell Albury as part of our IT Management Team. Londell brings over 7 years experience in building and managing teams, directing large scale technology projects, and a wide range of technical skills in multiple platforms,” said Ron Spaide, Ross University’s Vice President, Chief Information Officer (Interim). (Watch a VIDEO Synopsis on the progress of Ross University with Dr. Thomas C Shepherd within) Grand Bahama Island – In an effort to keep community leaders updated on the progress and future development of the Ross University Bahamas campus, the president of Ross University, Dr. Thomas C. Shepherd hosted an informal luncheon at the Westin Hotel on Wednesday, October 1st.